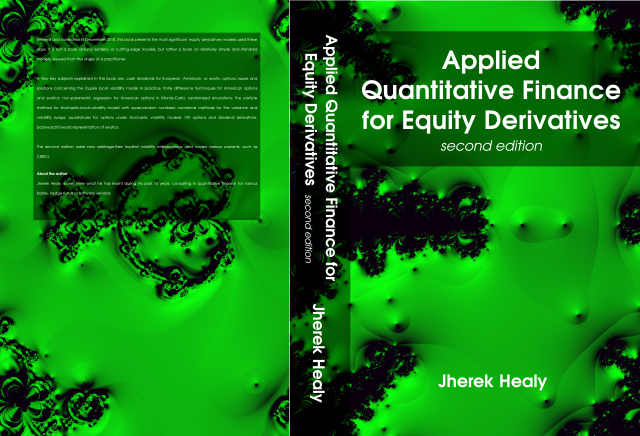 Forums > Books & Papers > new book "Applied Quantitative Finance for Equity Derivatives"
This is a small ad for my new book "Applied Quantitative Finance for Equity Derivatives", which you can find on amazon. 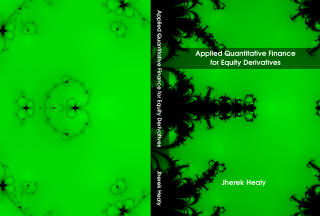 I think it is relevant to other people looking at nuclearphynance, since the book presents the most significant equity derivatives models used these days. It is not a book around esoteric or cutting-edge models, but rather a book on relatively simple and standard models, viewed from the angle of a practitioner. Please visit my website jherekhealy.github.io for the table of contents. Your book definitely looks interesting. Do you have a sample chapter to peruse? Amazon look inside feature allows you to read the first chapter and the appendices, unfortunately those are not the most interesting. Any plans to make this available via Kindle? @dgn2 I did not find a good way to present equations on Kindle, hence no Kindle edition. yes there is no good Kindle solution for books with plenty of equations, also the other platforms are lacking when it comes to documents with equations. It is surprising that no one has come up with good electronic book format here (except pdf file) ?? or is there such a platform? Must be a good business model to invent here for someone. indeed the content list looks good, v much in line with what we do, so we bought a couple of copies. For 2019, I have published a new edition of my book, in hardback on Lulu or in paperback on Amazon. This second edition adds new arbitrage-free implied volatility interpolations, and covers various warrants, such as CBBCs. The text has also been slightly updated. Those (such as myself) that purchased your first edition, just before the second edition came out, do they get a free copy of the updates on arb free interpolation?